Blondie and Brownie: Did You Get Your Tickets? Choice Streets is Sold Out! Did You Get Your Tickets? Choice Streets is Sold Out! 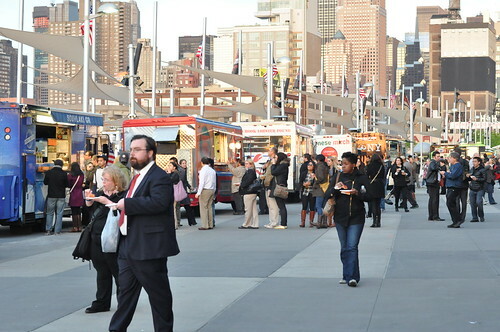 Last week the Voice announced 2 additional participating food trucks, making 9 food trucks in total so far: Desi Food Truck, Mike N' Willie's, Big D's Grub, Coolhaus, Gorilla Cheese NYC, Nuchas, Phil's Steaks, Souvlaki GR, and Valducci's Original Pizza. This year they plan on having 25 of the city's favorite trucks. What can we say? The Voice has great taste...Big D's and Coolhaus are two of the vendors featured in our book, New York à la Cart: Recipes and Stories from the Big Apple's Best Food Trucks . 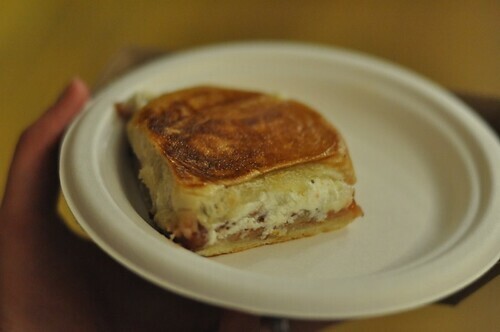 Not surprisingly more than a few of my favorite bites involve cheese. The homemade burrata from Anella was INCREDIBLE. I know it's cliche to describe things as "melt in your mouth" but seriously, I'm not sure what other words to use to describe the creamy, almost buttery perfection that was this little piece of cheese (with a spot of tomato jam and basil salt). 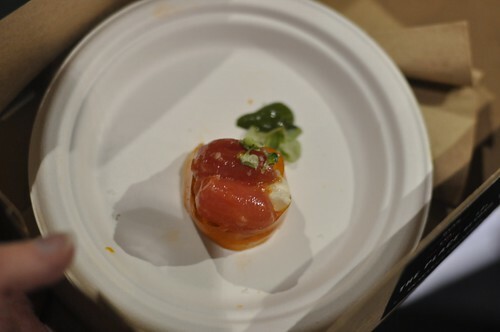 One of the longest lines I wanted it was for these tiny tomato and smoked feta tarts from Dirt Candy. After one bite of this smokey, cheesey goodness I was ready to get back in line to wait all over again for another. I spotted Mrs. Dorsey's Kitchen Grilled Cheese at the Columbus Circle market, but didn't have a chance to taste their wares until the Vendys. 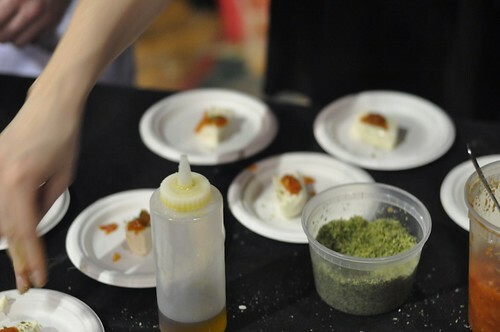 Their goat cheese with strawberry and mint preserves was an interesting take on the traditional grilled cheese. I can't wait until they open a shop in Prospect Heights. 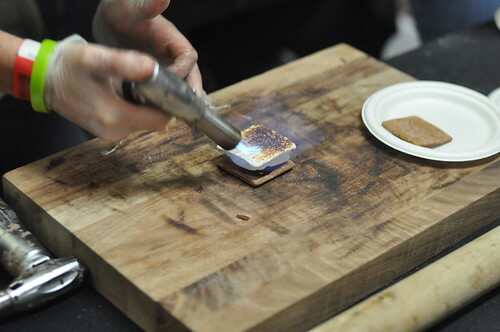 The folks from S'more Bakery wowed with their made to order homemade s'mores--who doesn't love seeing a pastry torch in action? 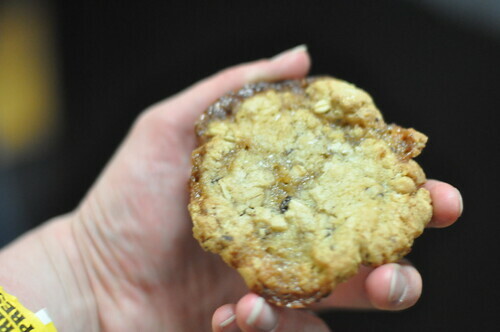 But it was their Salty Oat cookies with chocolate chunks and marshmallow that I'm still dreaming of. Salty, sweet, chewy and chocolatey. What more can you ask for? If you missed out on Choice Eats and Choice Streets, keep tabs on the events by following @ChoiceEats. Just another reason to come to New York this spring. 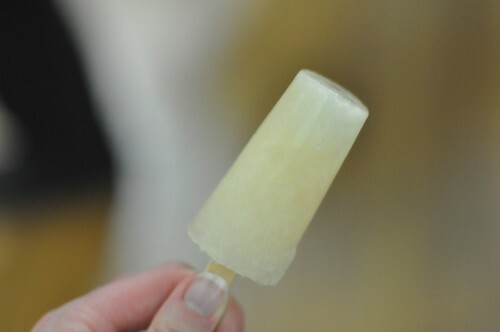 This looks not only tasty, but a ton of fun.